Anyone who has met my mum will tell you immediately that she’s an insanely creative and arty lady (which helps when you’re in the textile business like I am). 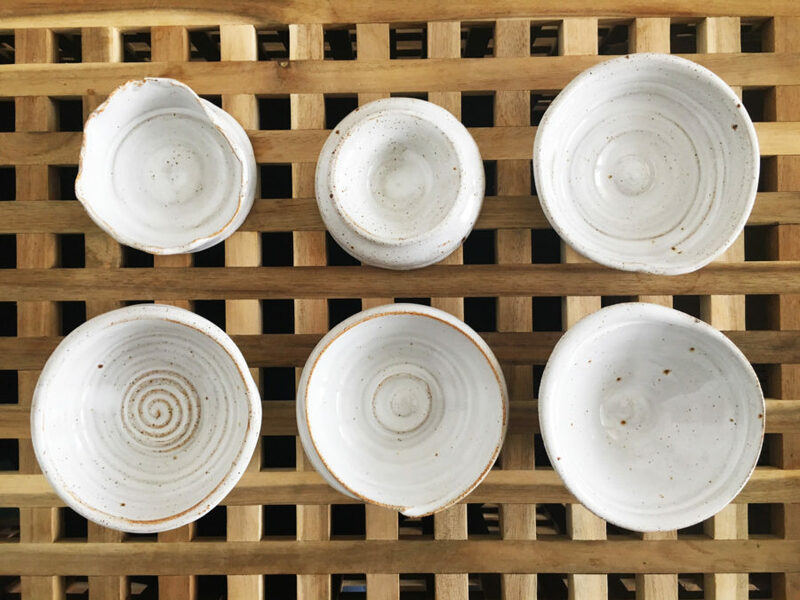 I’d bumped into pottery guru, Jess Jos, at a craft fair before Christmas and knew that my mum would absolutely love her rustic work. 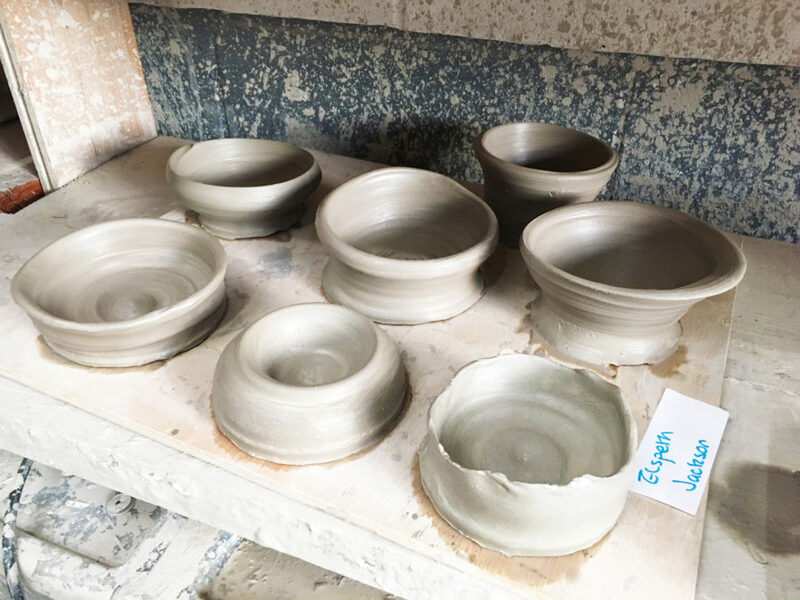 So, for Mother’s Day, I booked for us to go on Jess’ beginner’s pottery class at Stepney City Farm to get messy and make a few pots. A few days before the workshop I messaged my mum to coordinate but there was a slight hiccup. Either I’d forgotten to tell her the date or she’d forgotten to write the date down… either way she could no longer make the class so I’d have to find a mummy substitute… doh! Fortunately for me, I have a very loving and caring boyfriend who would rather suffer through 2 hours of crafting (his idea of hell) rather than have me go to a class all on my larry. Christian is a very talented man in many ways – he’s an amazing linguist, disgustingly sporty and I refer to him as the “walking wikipedia” as he’s so knowledgeable but he’d be the first to admit that “arty” things are not his forté. In fact, we once did a five minute pencil sketch of each other as a bit of fun and his rendition of me looked like it had been drawn with his foot. Either way, he came to my rescue and on the day of the class, we set out on our bikes for Stepney City Farm to get our pottery throwing on! 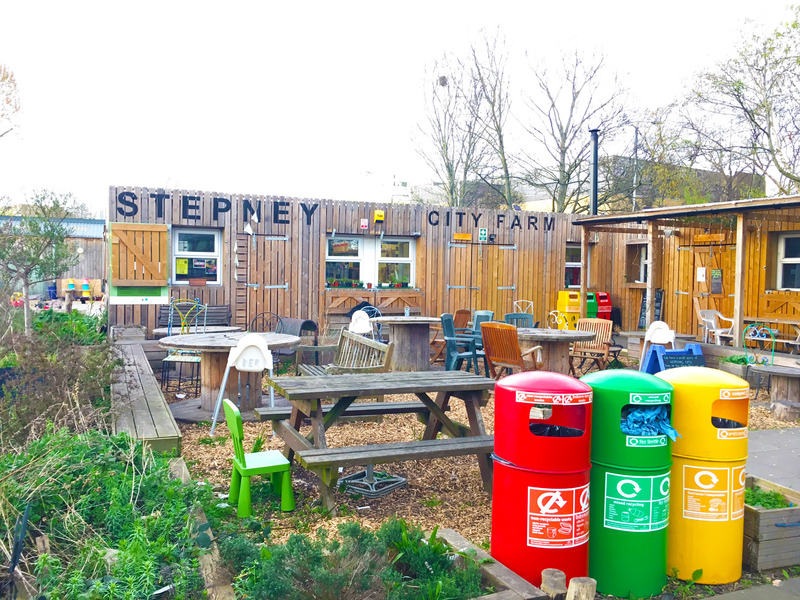 Our venue for the Jess Jos Pottery workshop was Stepney City Farm in East London. It’s a rustic oasis in the bustling city. Jess Jos’ studio is exactly as an artisan’s workspace should be… creative chaos with lots of beautiful things to look at. We could see pots, cups, bowls and all sorts of pottery in varying levels of completeness which was excellent inspiration. One of the things I love most about Jess Jos’ work is how timeless and classic her designs and colours are. I particularly like her aqua blue and white speckly glazes. 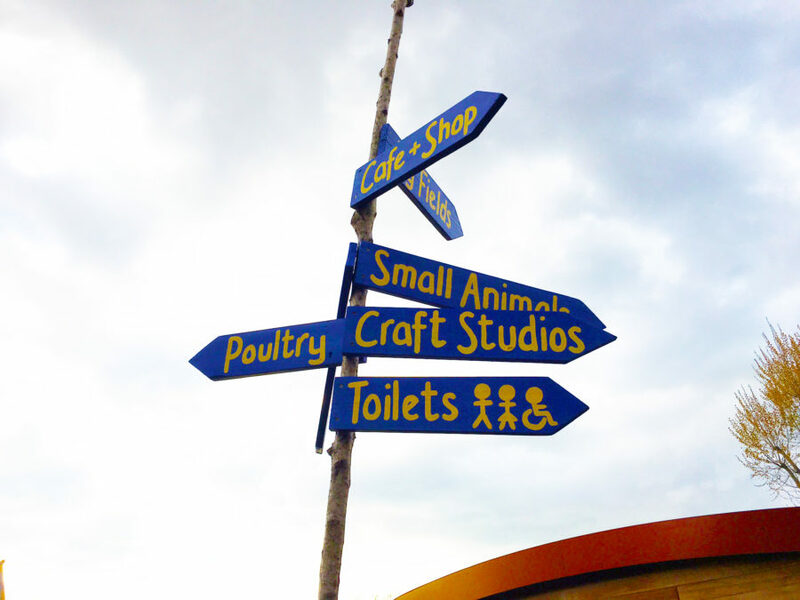 Colourful creative chaos… just like my rag rug studio! 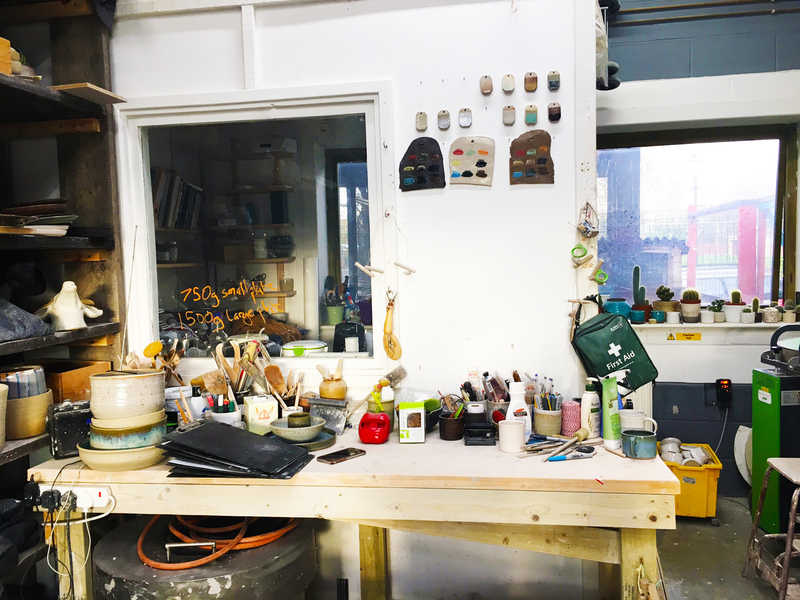 It was lovely being able to see some of Jess’ creations – what the pottery should actually look like! 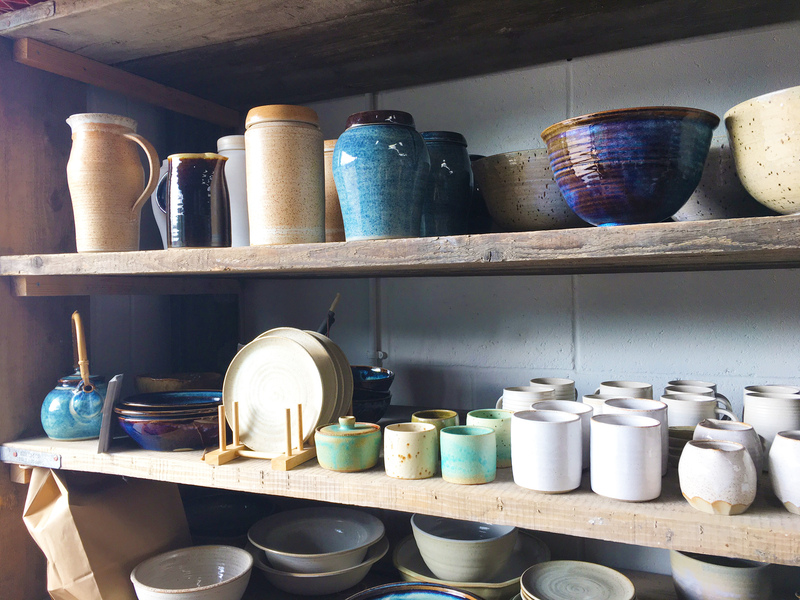 We put our coats and bags out of harm’s way (clay is a lot messier than rag rugging), donned our aprons (I’d obviously nabbed the beautiful Liberty print one) and stationed ourselves at one of the pottery wheels. 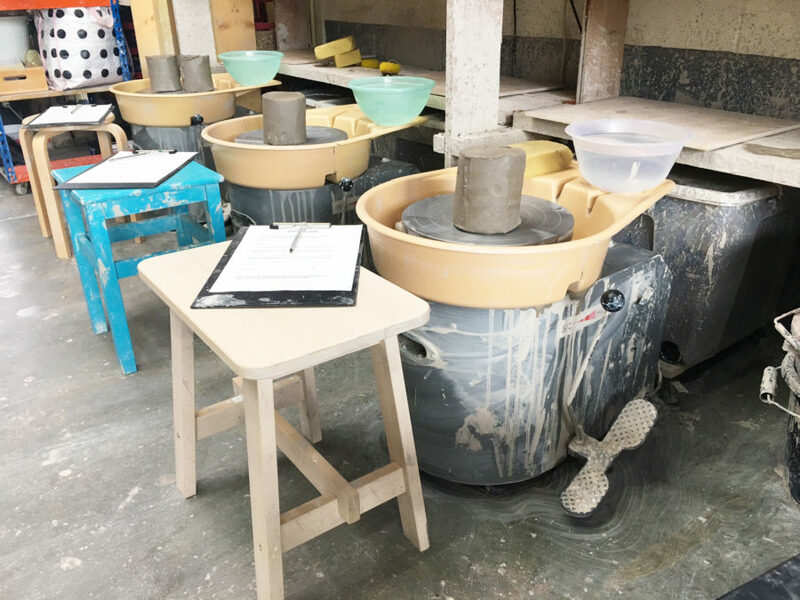 It was pretty cool seeing the pottery wheels all set up as you came into the studio. Jess then took us through the basic techniques of throwing a pot. It’s pretty difficult to explain without a video (and I definitely wouldn’t do it justice anyway) but it vaguely involved centring the clay on the wheel, pushing it down into a circular blob, lifting it up into a tower then pushing it down again. We then got rid of any excess clay around the bottom with a wooden tool (after some Googling, I think it’s called a “rib”) and opened up the clay into a pot shape with our thumbs. 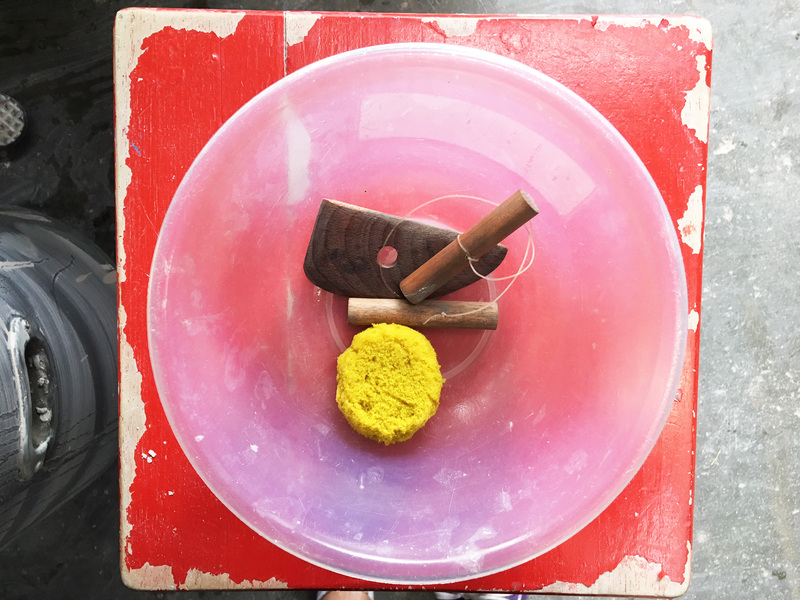 The tools we used were a cheese cutter, soft sponge and wooden rib. It was then down to you (and your skill level) what height, shape and quality of pot you ended up with. I finished seven pots in the class and Christian made three. Below is how they ended up before they were fired. p.s. I’m pretty sure there’s a tonne of specific vocabulary for all of this but for me, it was about different heights of blobs. My earlier pots are at the front of the photo and the later ones are further back. I think the one in the second row on the far right looks a little like a miniature toilet bowl. Christian’s pots got a lot better as he went along. The back right one was his last one. 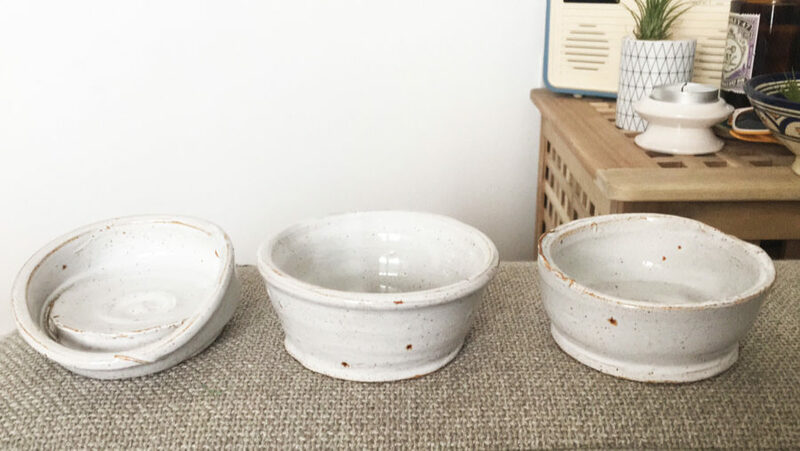 The pots looked a hell of a lot better after they’d been fired with Jess’ white speckly glaze. Christian’s pots got better as they went along. The middle one was his last one and the left one was his first one. 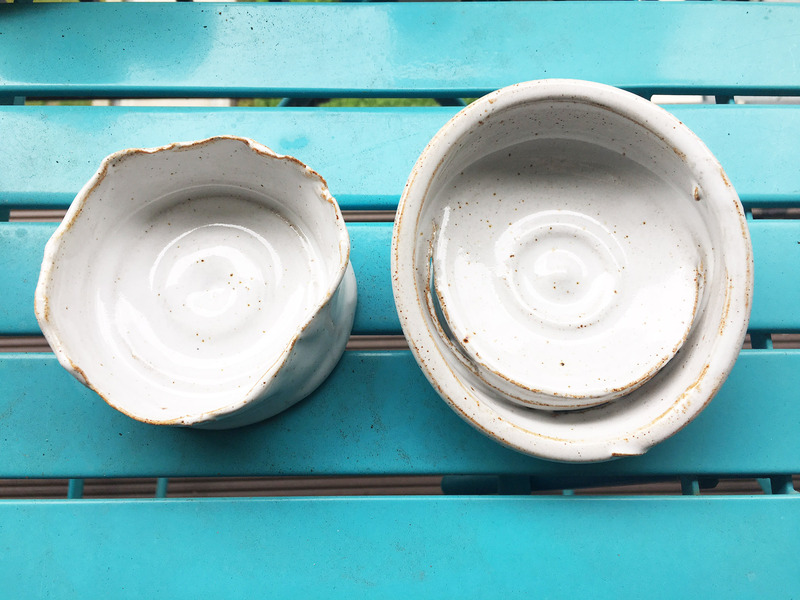 Mine and Christian’s first pots turned out a little kooky! Mine is on the left and Christian’s on the right. 2) Sometimes breaking the rules pays off. In the class we were concentrating on creating height and getting the sides of the pot relatively thin. I was so scared of lopping the top off another pot that on my second attempt I decided to just leave my pot as a thick, short, runty pot. Well, as it turns out, that’s my favourite of all the pots I made and it’s already become one of my favourite candle holders. My favourite piece from the workshop (at the front here) came about as a lucky accident. 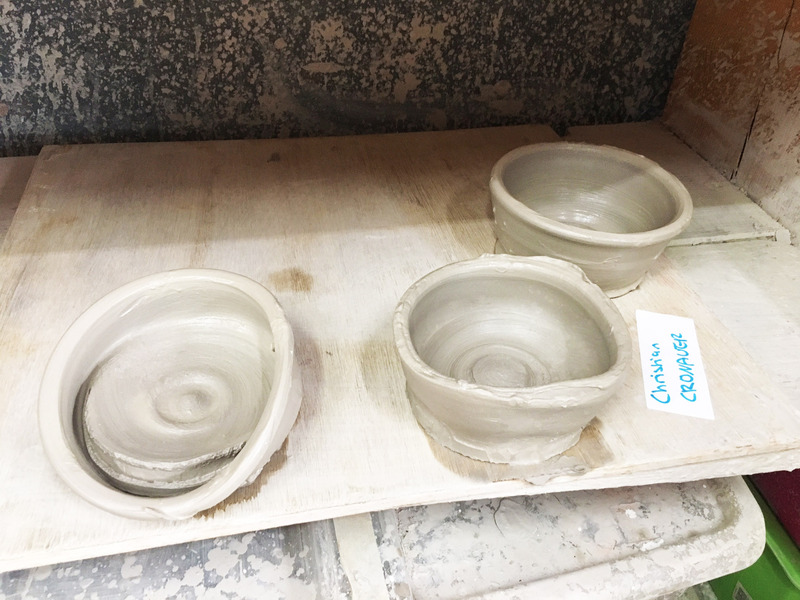 3) Throwing pots is fun!!! You may not become an expert after one go, but you’ll certainly have a tonne of fun doing it. It’s liberating being able to get super messy and no matter how wrong you go, you’ll have created something unique and one of a kind. 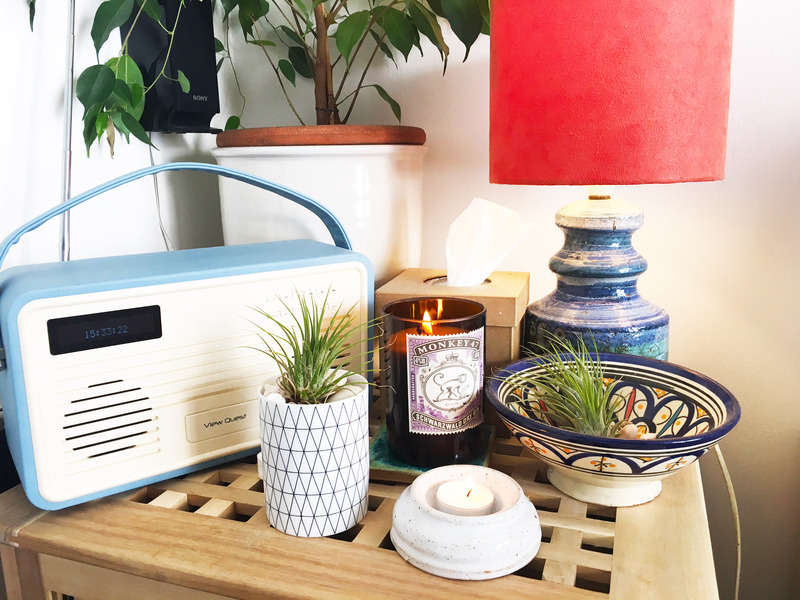 If you are feeling inspired, Jess runs a Sunday Taster Class for £45 (which is what I did) and you can find out more details here. Now I just need some ideas for what to use our bizarre collection of pots for!! Suggestions anyone? This entry was posted in Designer Spotlight, Inspiration and tagged 2017, Date Days, London, Other Crafts. Bookmark the permalink. ← The Largest Ever Rag Rug Workshop?